Shoe Cabinet with 2-Doors and 2-Drawers. Birch Shoe Cabinet with two pull out drawers and storage space on top. Holds 12 pairs of shoes. Sold completely assembled. This small cabinet features crown molding details and solid raised panel doors and adjustable shelves and can be used for a variety of functions. Solid Wood Shoe Cabinet with two pull out Doors and storage space on top. Custom Made Shoe Cabinet with 2-Doors and 6-Shelf and a base. This 2 Door 2 Drawer Shoe Cabinet Features 4 Shelves and will Hold Approximately 15 - 18 Pairs of shoes. Shoe Cabinet with 5 shelves. 2 Door Shoe Cabinet Wardrobe with 2-Doors. Beautiful Design. Shoe Cabinet with 2-Doors, 1-Drawer and 4-Shelves. This Shoe Cabinet Features Sliding Doors and 7 Shelves Inside. Features 3 Doors For Shoe Storage, One Drawer And Umbrella Storage. Shoe Cabinet with 2-Doors and 2- Top Drawers. Beautiful Design. 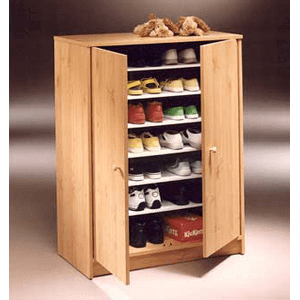 Shoe Cabine With 3-Solid Doors. Price Includes 3 Shelves that go all the way across.